The period between Christmas and Epiphany – know as the Twelve Holy Nights – is an important time of year. It provides a time for reflection and reconnection with our spiritual selves. This abridged extract from The Twelve Holy Nights, shows how we can make the most of this experience. Inspired by Norwegian folklore, Frans Lutters suggests a practical exercise to clarify our purpose heading into the new year. During a dark winter, between Christmas and Epiphany long, long ago, Olaf Åsteson had an extraordinary experience which can be viewed as an initiation into the great secrets of existence. After this experience, Olaf had become spirituality stronger and felt better prepared for his responsibilities. The same is true for each one of us. Our lives today place great demands on us requiring vision and decisiveness. Working in a special way with the Holy Nights can give us an inspiring potential to step into the New Year with greater consciousness and enthusiasm. In our day the time between Christmas and Epiphany is still experienced as a special time of the year. Many people feel the need to visit each other and do nice things with the family. They go to a concert, or a show; they take a walk in the Christmas mood of the countryside, and do many other pleasant things. But there is also frequently a longing for inner deepening and meditative moments. Music, a story, or a good conversation may then feel just right. In recent decades something new seems to be growing around efforts to work concretely with the Holy Nights in a fully contemporary manner. Increasingly people use the time between Christmas and Epiphany for reflection, bringing things to consciousness. Groups have formed in the course of time of people who support each other for the preparation and actively work with the time of the Holy Nights. I had the good fortune to assist at many of such gatherings. Year after year a fruitful way of working grew to take advantage of this time ‘between the years’ in an agile yet earnest manner. Out of this work I would like to suggest a number of ways to make the time of the Holy Nights an inspiring and creative experience. First of all, you can decide to pay attention to your dreams every night. Just like Olaf Åsteson you will notice that this resolution alone already has an influence on the quality of your dreams and the clarity with which they stay with you after you wake up. You can strengthen this resolution by using a notebook or sketchbook so as not to forget the dreams. For the frustration with dreams is that they fade so quickly if we do nothing with them. Thus, once we have made this preparation, a notebook or sketchbook is waiting for us by our bedside at Christmas Eve. Then the time has come. In the evening of December 24 open the notebook. And now follows an important decision. For in this evening of the birth of the Christ Child you write on the first page the subject you want to work with this year during the Holy Nights. You have endless possibilities for this theme, and therefore it is good to start contemplating some of these already during Advent, the time of preparation for Christmas. The idea is that you stay with the same theme throughout the whole period of the Holy Nights. Every night we write or draw something about the chosen theme that occurred to us or came up in conversation. If we consistently do something concrete with the notebook or sketchbook every evening, we create an opening for very special experiences. Why is this work in the evening so important? Many years’ experience show that this activity if comparable to putting a stamp on the envelope of a letter. But now, this letter is going to a very particular part of our world, namely the world where we sojourn every night, especially during the Holy Nights. 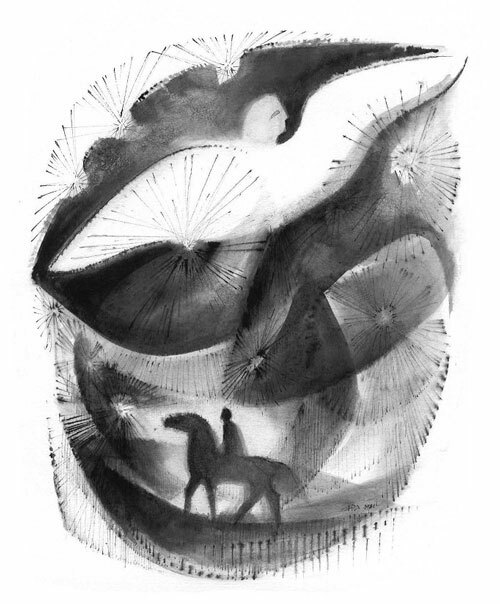 The subject we work with those twelve nights acts like a focal point on our experiences in the night and brings, when we wake up, significant ideas and dreams. The Twelve Holy Nights provides an inspiring opportunity to start the new year with revitalised consciousness and enthusiasm. It draws on Norwegian folkore to help us find spiritual calm and renewal as the New Year begins. Author and experienced Waldorf teacher Frans Lutters has led many workshops on this theme. 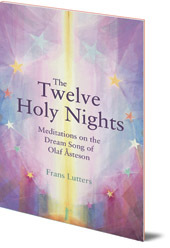 His insights are collected in the commentary and meditations in this book, alongside the text of the Dream Song.